Growing up both me and my brother were big omelet fans. On weekends we’d fidget at the table waiting for Mom to bring in plates of two and three-egg omelets dripping with cheese and laden with hot crispy bacon. Oh yeah, were those ever the days. And then came the news. Eggs are bad; they’re full of cholesterol. Cheese is bad; it’s fatty and full of oils. Bacon? Let’s not even go there- it was the Darth Vader of breakfast foods, always tempting you to the smoky, greasy, crispy Dark Side of the food pyramid. It seems that every day, the media is changing what “healthy eating” is. Chocolate is bad; no, wait, now it’s good. Wait again, now it’s good only if it’s super-dark chocolate. Alcohol is bad- nope, wait red wine is okay. Fish is good- but only if it’s not stuffed full of mercury and other contaminants. Veggies are great- as long as they’re organic and not coated in pesticides. Though some fruits and veggies are fine no matter what they’re grown in. Some say, a good wash is all you need to make food safer to eat. Meats are evil; meats are good; only certain types of meat are okay- it’s enough to give me mad-cow disease. Let’s face it: the conflicting, changing messages are enough to drive anyone’s blood pressure through the roof. And with chronic illnesses like Lupus, eating healthy is pretty important. However, it can be overwhelming to even know where to begin. What’s okay to eat? Are there “lupus-friendly” foods? Can I still enjoy bacon and burgers or do I have to only eat brown rice and veggies imported from countries with names I can’t pronounce? Rome wasn’t built in a day. Every body is different – there is no magic bullet approach for all people, no food laws carved in stone. In the end, you want a diet that’s going to give your body what it needs. No more, no less. And that’s going to take some research, some thinking and lots of trial and error. Whether you’re starting a new eating plan from scratch or just looking to make a few improvements to how you already eat, these are a few of the ideas that have helped me. Get on the couch and tell me about you parents. Believe it or not, I think the food we are raised with has a big impact on how we eat when we’re grown. What were your favorite dishes as a kid? Does your stomach growl when you think of them? What were your comfort foods? Do you still eat those foods? When? No offense to my Mom, but growing up we had meat and grains at every single meal. Dinner was the biggest meal of the day, even though we weren’t active afterward. Veggies were those awful, bland little frozen dice-cut carrots and lima beans. It took me years to wean myself onto more veggies, more often and to cut back on the red meat. Frozen is my personal staple- I find it more cost effective since I don’t have to worry about the food spoiling before I can cook it. But, now I’m trying to get more fresh veggies as well. Look at your meals. If you’re a sucker for grandma’s recipes, look at ways to make them a little healthier. Instead of tons of butter, maybe try half the amount or drizzle with olive oil instead. Big on rice and pasta? Add some corn kernels for a bit of sweet crunch or broccoli for some fiber. Experiement. Why do you eat? Part of eating is emotional and that part needs to be addressed. Whether you tend to pig out when stressed (I sure do- especially sugary treats and pizza), or starve yourself when you feel guilty or depressed (or just fat), take the time to examine how you feel emotionally when you’re eating. One trick I’ve used to limit emotional eating is that when I feel like eating, I stop and listen to my body. If I’m actually hungry, I’ll “feel” it in my stomach. If I don’t feel hungry, I have to ask myself why do I want to eat? Am I bored? Am I stressed? Do I just want that burst of sensation in my mouth? Food journals are a good way to keep track of how much you eat and when- but only if you’re willing to be brutally honest with yourself when you keep one. If you have issues or past trauma that you suspect might be tied to your eating habits, there’s nothing wrong with getting additional support from a therapist or support group. Be Sensible. I’m not a nutritionist; I’m not a doctor, so my opinions are not medical advice. That said, I don’t try to kill myself following the latest changes in what’s considered healthy eating. Personally, I try to go for a balanced diet- a little bit of everything, in reasonable, logical amounts. If I really crave something sweet, then I’ll have something sweet. If I catch myself snacking, then I’ll try to have healthier snacks like greek yogurt or nuts. I watch my sugar and salt intake because I have damaged kidneys. If I really want some meat, I can pick up little tiny steaks from the supermarket and have that- I don’t need a huge rib-eye dripping with sauce. I’m not very physically active, so I try to have smaller meals. I’m not active at night, so I try to have my lightest meal for dinner. Look at your lifestyle and think about what’s logical for you. Talk to a nutritionist for ideas. Talk to your doctor. THINK. Read the labels. A good sensible rule of thumb is to read the labels. Not only to give you an idea of how much salt, and sugar is in your food, but also what kind of chemicals. If you don’t recognize what’s on the label- do you really want to eat it? Google “how to read nutrition labels” for ideas on how to make sense of the labels. Stick to simple stuff and look up anything that you’re not sure about. Or better yet, learn to make some of your favorite staples at home, such as mayo or salad croutons or dressing. Not only will the stuff you make at home be more healthy (you know exactly what’s in it), but you can also really experiment and make your own signature blends. Get your friends and family hooked by giving them bottles as gifts! One of my friend’s dad does this and made the most awesome chipotle sauce- I don’t like spicy stuff, but I couldn’t stop eating it! And another time he made this incredible peach jam. The internet is full of instructions on doing these things- have some fun and experiment! Finally – don’t take it all seriously. Though the media likes to make food out as an enemy causing obesity and disease wherever it goes – it really isn’t. Food is…well food. Like any other tool, it requires understanding in order to be properly used. Get to know food – how it’s made, what goes into it and how it affects you. Don’t pressure yourself to change all your eating habits in a week, or a month or even a year. Take some pleasure in just the journey and be open to trying new things. Come on – it’s only food. If you really don’t like it, trash it. Problem solved. Food shouldn’t be an added stressor to your life. Eating healthy is a process that I don’t mind taking my time with. I’m finally beginning to like salads, which I always likened to eating grass and to enjoy making my own salad mixes and even my own croutons (which is ridiculously easy). And I’ve experimented with making healthier versions of my comfort food recipes- like making pizza toast with rich tomato paste and herbs and olive oil on fiber-rich wheat bread. Or mac and cheese mixed with corn and broccoli bits. I’ve even learned to fry turkey bacon to a nice crispy char that’s pretty close to the real thing. I don’t feel deprived. I’m not skinny either, but like I said, it’s a process. Once I’ve comfortably absorbed new eating habits, then I can change them further. I might try lessening my carb intake next and seeing how that works. What small step can you do this week to eat a little healthier? 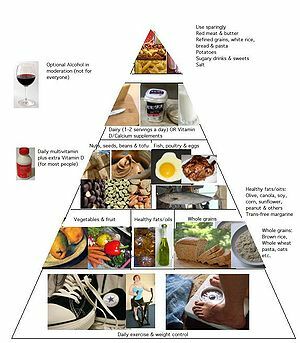 This entry was posted in ADL Archives, Food and tagged advice, choice, Comfort food, diet, food, health, healthy eating, lupus, misinformation, nutrition, planning, tips. Bookmark the permalink.